From PROTO CENTRAL PACIFIC *Rewa, Cerbera sp., probably Cerbera odollam , (Apocynceae). 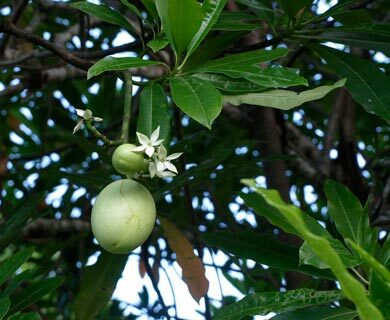 The generic name of the tropical trees known as leva or rewa, Cerbera, recalling the vicious guard dog, Cerberus, of the Greek god Hades, ruler of Hell, seems somewhat odd when you look at this rather beautiful tree with its attractive flowers and fruit, especially as it's sometimes known as the "sea mango". 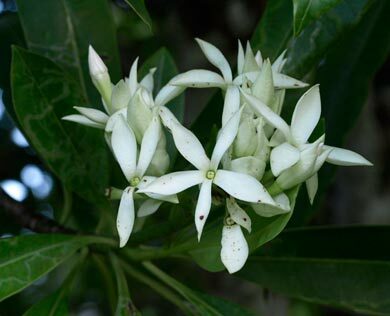 However, its seeds are rich in a deadly poison, cerberin, which, according to the entry for Cerbera odollam in Wikipedia, is difficult to detect after ingestion and therefore frequently used in homicides (and also suicides) in India (and also occasionally in parts of Polynesia). It was also widely used as a test for innocence in trials by ordeal in Madagascar, resulting in the deaths of thousands of people over the protracted period when its use for this purpose was in vogue. 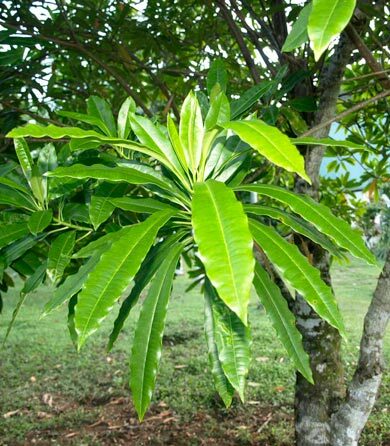 It belongs to the same family as the oleander, also a set of highly toxic species although widely grown for their ornamental value, and like the oleander the smoke from burning Cerbera wood is also toxic. The New Zealand tree whose flower and name are derived from *lewa share a vague similarity in the appearance of their leaves, but otherwise are very different. The New Zealand rewarewa ("like a rewa/*leva") belies its name, except for the leaf shape, the bouyancy of its fruit, and the beauty of its otherwise quite different flower, which has a sweet, perfectly safe honey very useful in relieving sore throats without causing the demise of the patient! 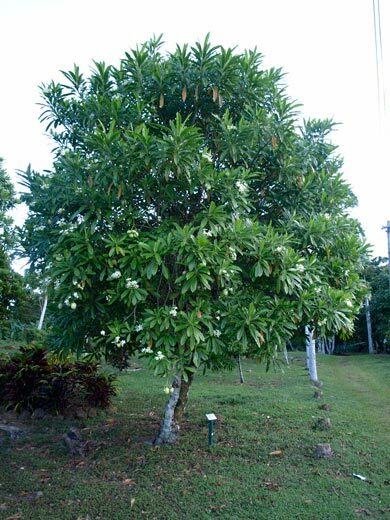 Further information : There is information about Cerbera odollam, and a photograph comparing C. odollam and C. manghas, in the Cook Islands biodiversity database.